Tartu County Court on Monday found two men and two women guilty of handling more than 2.5 kg of marijuana and sentenced them to prison for terms ranging from five to six years. The court sentenced Alberts Burkevics, 43, to six years and Izaura Burkevica, 28, to five years in prison, while Ivailo Siiman, 50, and Lunda Mitrauska, 51, were both sentenced to five years and six months in prison, spokespeople for the South District Prosecutor's Office told BNS. Alberts Burkevics and Izaura Burkevica were accused of obtaining at least 1.5 kg of marijuana in Latva between July 2016 and May 2017 as members of a group and on multiple occasions. 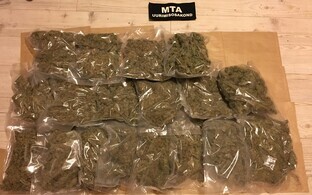 They kept the marijuana at their home in the border town of Valga and forward it in both small and large amounts to several persons in Valga and Tartu. Burkevics was likewise accused on supplying at least 400 grams of marijuana to two persons in Tartu and operating a motor vehicle without the right to drive on six occasions. According to the indictment, Siiman and Mitrauska obtained at least 1 kg of marijuana during the period from 2013 to 2017, which they forwarded in consumption amounts and amounts of up a couple of grams to other people primarily within the vicinity of their home on Rahu Street in Tartu. Jane Pajus, prosecutor at the South District Prosecutor's Office, said that while the court agreed with the prosecution that the circumstances described in the indictment had been proven, it handed down lighter sentences than sought by the prosecution to the two men and did not endorse a substitution claim for almost €25,000 in criminal proceeds. The prosecution will therefore file a notice of appeal to learn abut the detailed grounds of the judgment and decide about an eventual appeal. "Consistent work by the Drug Crime Unit of the South Prefecture [of the Police and Border Guard Board], as a result of which we managed to put an end to the unlawful business of a group handling marijuana on a systematic basis for years, helped us reach today's decision by the court," Pajus said. Kristjan Tommingas, head of the Drug Crime Unit of the PPA's South Prefecture, said that trading in narcotics had been a lifestyle for the individuals sentenced by the court. 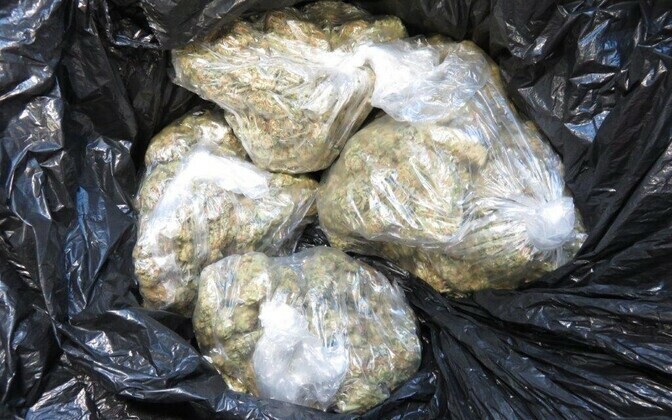 "A young child posing for a photo with a 1 kg bag of cannabis and cash is an appalling sight and a clear sign of danger, demonstrating how parents who have tied themselves to drug crime are depriving their child from the start of every opportunity to find the right values in life and lead a law-abiding life," he said, commenting photos of the individuals. Tommingas noted that the criminally earned money did not help the members of the group improve their standard of living as most of the proceeds were lost to casino gambling. "In other words, it was a vicious cycle in which the money earned by selling drugs was spent feeding a strong casino addiction, while at the same time acquiring narcotics for oneself as well," he added. The police put an end to the drug dealers' business in spring 2017, when a group of people were arrested near the Estonian border in Valga during an attempt to bring drugs from Latvia into Estonia; other members of the group were simultaneously arrested in Tartu. The police learned that the drugs were being brought into Estonia from Latvia 0.5-1 kg at a time. Burkevics had been previously punished pursuant to criminal law in both Estonia and Latvia. Siiman has no punishments pursuant to criminal law that have not been expunged, while Burkevica and Mitrauska had no prior records. The investigation was conducted by the Drug Crime Unit of the PPA's South Prefecture under the supervision of the South District Prosecutor's Office.